Sometimes the way we look at things is not always as objective as it might be. With several new businesses in town one might conclude that the retail market place in Tisdale is moving forward or at least holding its own. In actual fact it is pretty hard to tell. The closing of Zellers last fall had a discouraging ripple affect toward all retail and service outlets in the community simply because the large department store that had attracted customers to town was no longer in business and many customers who might have in the past gone from the department store to other stores stayed in their cars and trucks until they were in Prince Albert or Saskatoon. But despite closing of Zellers we who live here want to see things in a positive light and may sometime ignore the obvious. I am not entirely sure of this but am willing to consider it as a factor in a small town perspective of a small town. Saturday Family Furniture which had chanced hands about a month ago as the Nipawin merchant went through the motions of a closing out sale finally locked the door on this building in the middle of one of the only two blocks in Tisdale's central business district. At the bottom of the page you can see the one side of the street and notice the situation. Wolfers restaurant is now for sale or rent as the operator has reached a point where after many years in the restaurant business wants to go into something else. The Wall restaurant is enjoying steady business and its owners have become a part of the Tisdale business community. Sonja's has a for sale sign in the window. 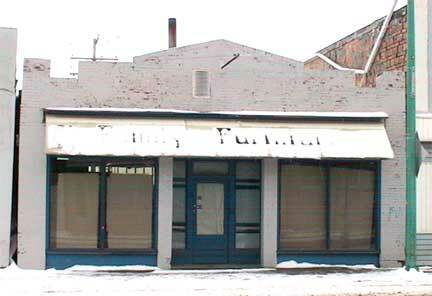 Fairlight Studios closed this fall for a while then reopened and beside it is the now closed Family furniture. On the opposite side of the street Sweet Aroma has been looking to sell simple because of the burden of commuting to and from work each day by the owner. The new Kearose shop is located on that block and only one store front has rental space available in the front of Nick's barber shop. 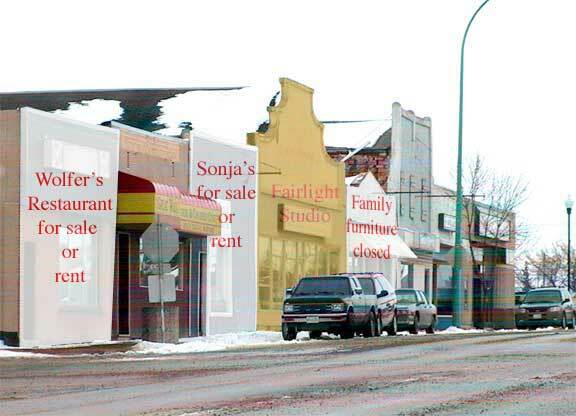 If we took the one side of the street shown it might suggest that three out of eight businesses were for sale or closed. This is the problem with a small town. The sample is to small to verify the overall environment. 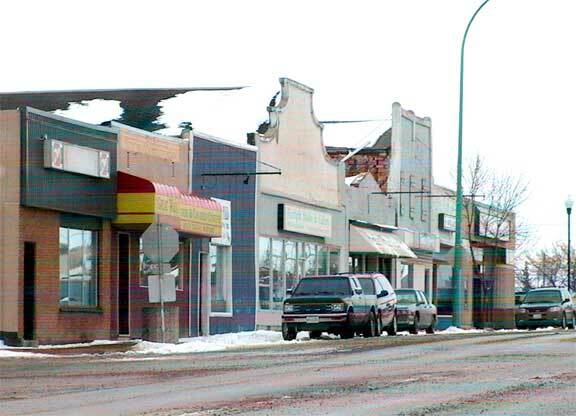 Many Tisdale businesses are doing quite well and there are far more jobs available in Tisdale businesses than there are people to fill those jobs. Restaurants are particularly a problem with the of them downtown for sale we can note that Hannigans remains empty since it closed in October 2003. My Way in the mall has been looked for a new owner while A&W, Chicken Delight, Subway and Mr. Ribs have all the business they can handle. Business people are particularly nervous about discussing this topic. When I mentioned the empty Zellers space in the Mall I received a particularly nasty phone call from the Mall management. There is no question that Tisdale has been hurt badly by the absence of a mainline retail department store and I just feel the folks at the mall are far more keenly aware of that than I so their anger at me is completely understandable. SAAN store is in its final week of its sale of all of its stock. With SAAN stores in Nipawin Tisdale and Melfort this is a lingering hope that the new owner of these stores will decide to keep the Tisdale one open once it has liquidated the SAAN merchandise. We will know in a week or two if this store will close or reopen as something new. As an optimist I truly hope that the businesses in Tisdale can continue to prosper and to me the optimism of Brett and Tenny Keating opening Kearose Clothing & Tack, Shawn Doherty it buying TSL Computers are excellent indicators as to the economic health of the community. This page is a story posted on Ensign and/or Saskatchewan News, both of which are daily web sites offering a variety of material from scenic images, political commentary, information and news. These publications are the work of Faster Than Light Communications . If you would like to comment on this story or you wish to contact the editor of these sites please send use-mail.